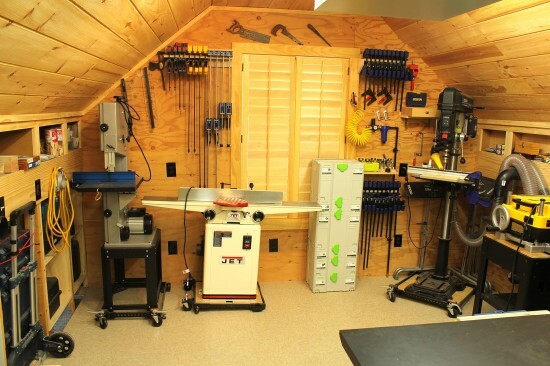 Welcome To My Workshop / Woodworking Shop / Tool Testing Cave! 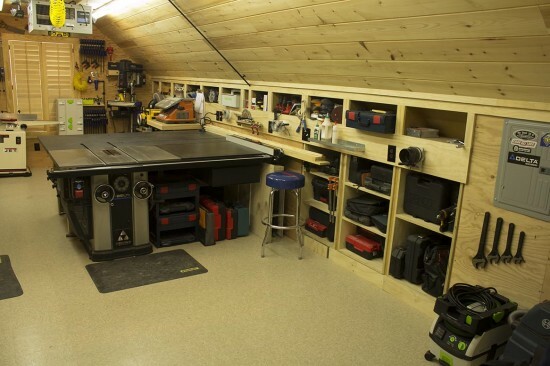 Growing up the son of a carpenter it didn’t take me long to start dreaming of a day when I could have a woodworking shop similar to the famous shop of Norm Abrams. In high school I was always super happy on days we had wood shop class. 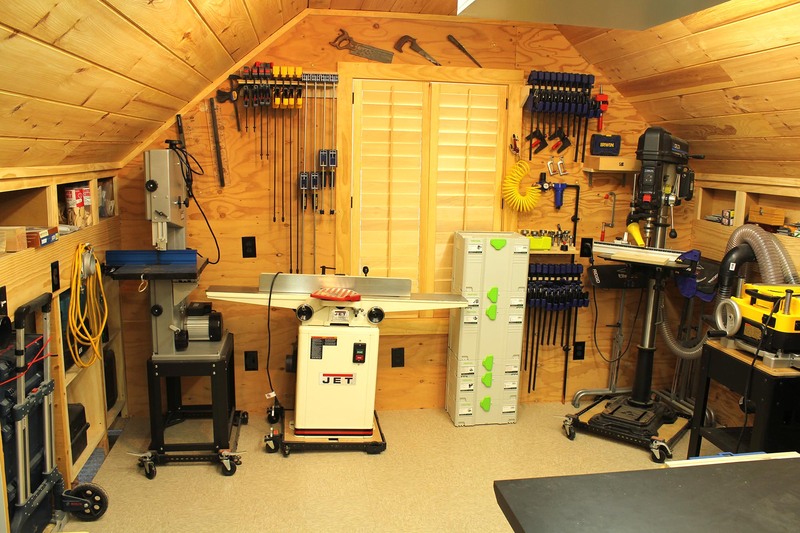 So it’s only natural that I’m over joyed to finally have my own special space that serves as my workshop, woodworking shop and tool testing facility. My new workshop is fairly unique in the sense that it’s on the 2nd floor above my garage. 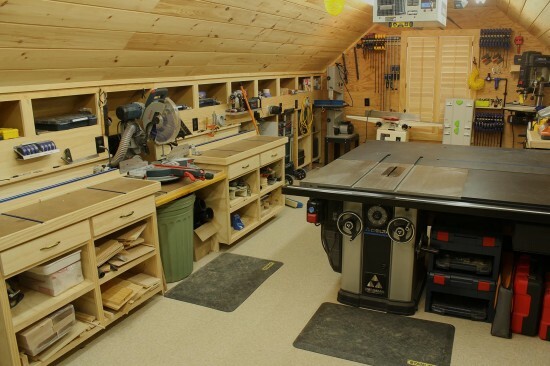 While I’d much rather have an entire building dedicated to the workshop/woodworking shop this is the only space I have available at least for the time being. Obviously this poses some interesting constraints but I think you’ll find the shop is pretty sweet considering! 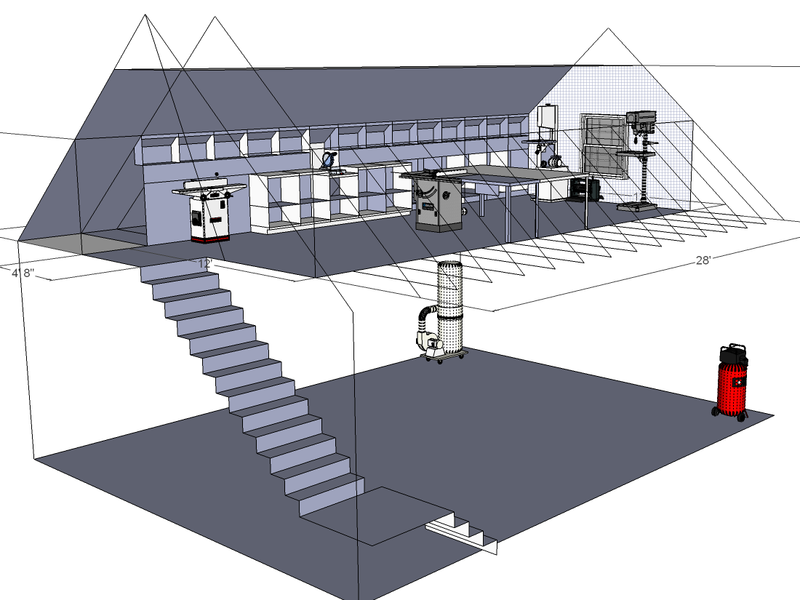 Above is a 3D rendering of the new shop built in Google’s Sketchup. This program helped me not only visually plan the space but also helped me check clearances and interferences with such a crazy shop design. While this rendering doesn’t show many of the walls they are in the model. This view is the best to show the extent of the shops design. Most of the equipment shown above are symbolic. 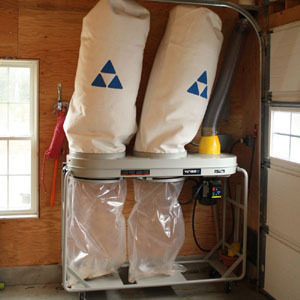 For example, the dust collector is actually a much larger, 2 bag system from Delta and the Air compressor is a fixed base unit that is also larger. Below are some photos showing the current state of the shop. As you can see I’ve utilized both the space in the garage below and the shop above to maximize the space. The decision to place the dust collector and air compressor down below in the garage made a huge difference. It also allowed me to place them the furthest distance from both the shop and the house cutting down on noise. 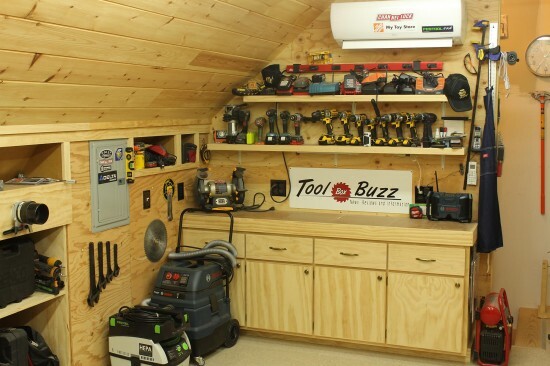 The shop design also includes quite a bit of built-in cabinetry along the sidewalls. This will also help me maximize both the open working areas and my storage needs. The space above my garage was framed using pre-engineered attic trusses. This allowed us to have a completely open garage below with no columns and a nice large space above for the shop. The shop is heated and cooled with a LG Art Cool™ Premier Duct-Free System Model LSN090HYV. This exciting mini-split heating and cooling system does a fantastic job in the workshop and it’s incredibly quiet. 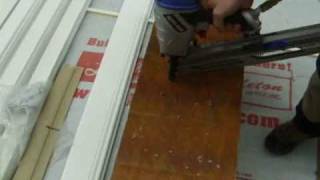 Mini-splits are great for renovations and a perfect solution for work shops in locations like basements, attics and even garages. 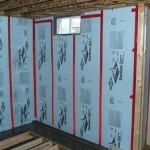 Because the shop is located on the 2nd floor of the garage in the attic space, insulation is incredibly important. Without it I’d have to survive 100 degree plus days in the summer and below 0 degrees in the winter. Because the shop is in the attic I decided to insulate the rafter bays with foil faced foam board. This allowed me to maintain good air flow from the soffits to the ridge vent. Between the insulation and the mini-split the shop is easily kept around 70 degrees even on a hot sunny day. The new shop is set up with Delta’s Model 50-763, 3 HP Motor Dust Collector running at 2700 CFM. I’ll be updating this section in the next few weeks. I’ll be writing several articles on this setup and topic. For my shop I’ve used plastic piping for all the dust collection. While plastic offers a cheaper solution compared to metal ducting there are many people that consider it a shock hazard. I’ll be sharing my take on that subject along with some design tips. 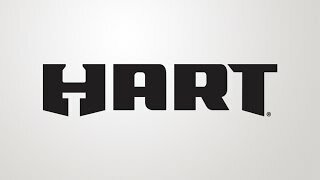 Visit the Dust Collection page. 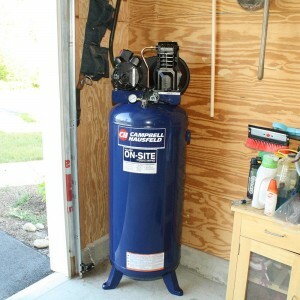 I’m using a 60 gallon upright, oil lubricated compressor from Campbell Hausfeld. 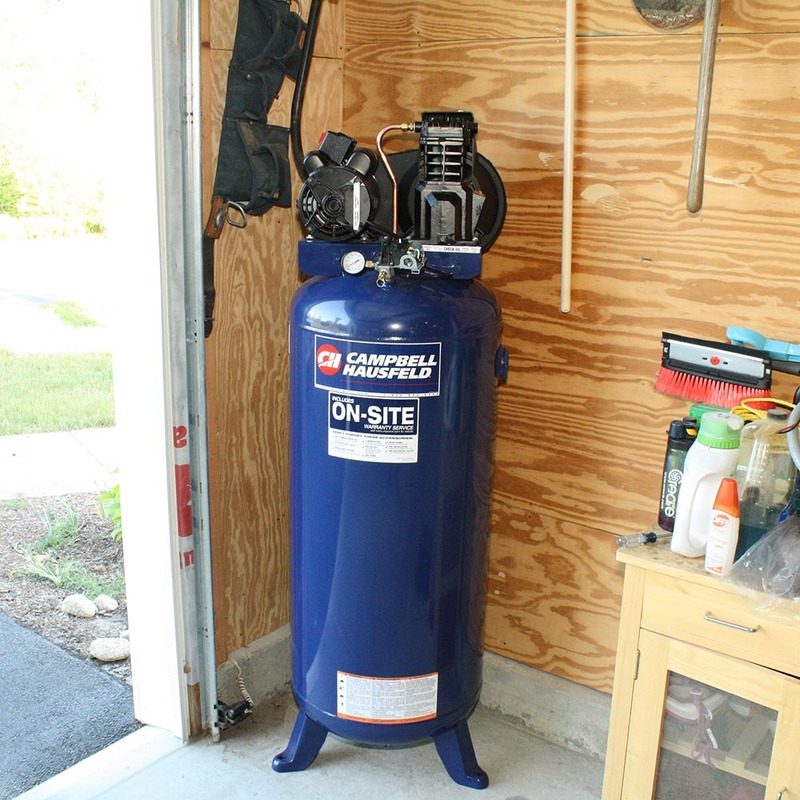 The compressor supplies air for both the shop and garage. I used copper piping to run air lines in the garage and in the shop. I know some people use PVC piping for compressed air as it’s easy and cheap, but it’s fairly dangerous in my opinion. PVC can break and when it does the result is exploding pieces of plastic, not good!! I’ve got more information on my setup on the Shop Compressed Air page. 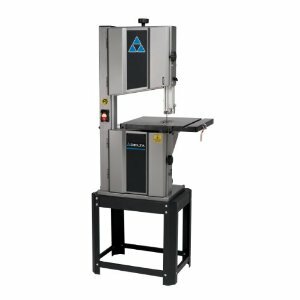 I use the miter saw station for breaking down long material and crosscuts that don’t need to be “insanely” precise. The heart of this is the Bosch 12″ GCM12SD Glide Miter Saw. The GCM12SD is a fantastic shop saw (I say that because in my opinion it’s too heavy for jobsite applications) and the patented “Glide” system really saves some room behind the saw vs a traditional rail system. I built a bench on either side of the saw with drawers and open shelving below for storage. The bench features a 1-1/2″ thick plywood top with 1/4″ hardboard on top (replaceable). 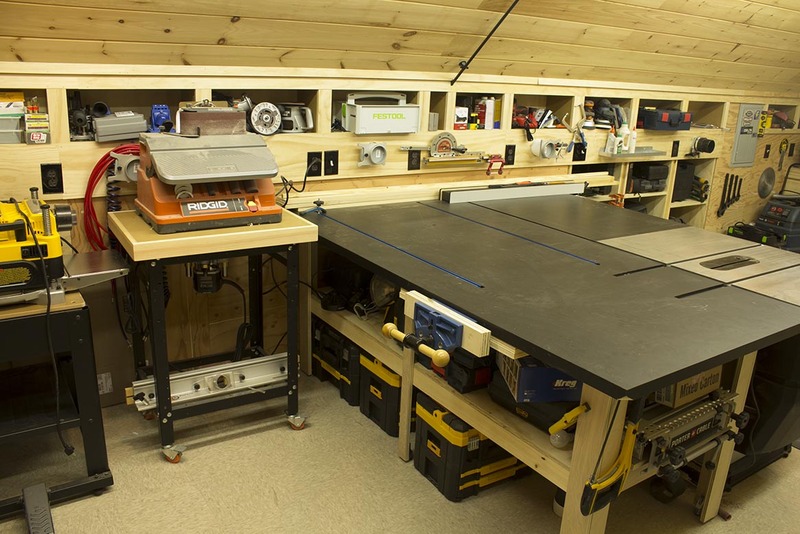 I also installed Rockler T-Track on the top of both benches to secure the removable fences and also so I can use the bench for assemblies with clamp down points. You can read more about the T-Track and Kreg Precision Trak & Stop System below. For dust collection I have a hose connected to the saw plus I installed a dust hood behind the saw. I’m able to catch about 80% of dust between the two which isn’t bad but not as good as I’d like. The heart and soul of the new shop is the Delta Unisaw! 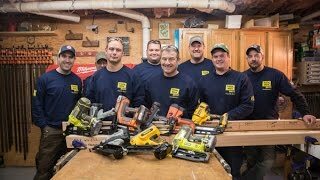 I had the pleasure of traveling to the new headquarters of Delta Machinery in the Fall of 2011 to actually watch this saw built. It was such an honor to watch men and women here in the US build this machine from start to end. Over 90% of the components are built in the US by Americans! Having used this saw for several years I can tell you it’s one of the best out there. 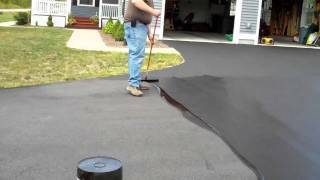 The precision and quality are outstanding. Several features really stand out including; the “up front” controls for both blade height and bevel, quick release riving knife lever, and large easy to access throat that makes blade changes very easy even for guys with big hands like myself. 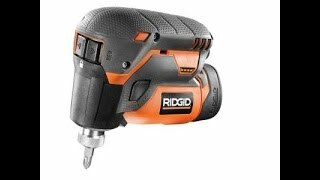 I’m using the single phase 220V model and it offers great power and runs very smoothly. 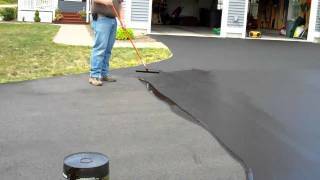 The day it came off the assembly line the man in charge of supervising production showed me just how smooth it operates. I placed a nickle on edge on the cast-iron top, turned the machine on, and that nickle stood right where he placed it and never even wobbled. After many hours of use the saw is still that smooth! 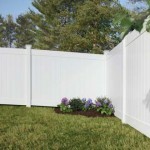 I’m also very happy with the Biesemeyer fence that comes with the Unisaw. 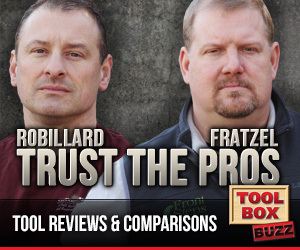 It’s incredibly simple yet very effective and very easy to tune in for precise results. I also installed a bench vise on the table. The Rockler 9″ Quick Release Workbench Vise has become an essential tool in the shop and one I’m very happy with. I really like how well the quick release feature works and how well the vise is built. A must have for any shop! 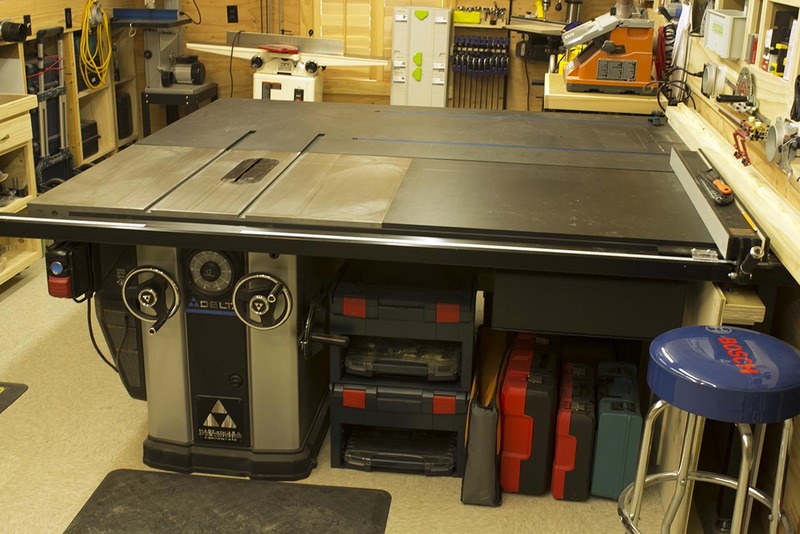 Many of the pieces of equipment in the shop use mobile bases so I can easily more them around the shop. In my shop I like to use Portamate Mobile Bases. They are high quality, very well built mobile bases that offer lots of flexibility in sizing and capacity. Check out a recent review I wrote on their Mobile Bases. 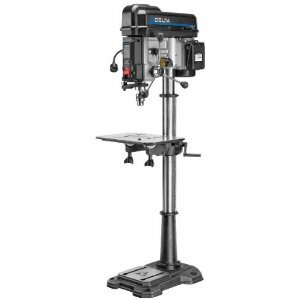 The picture above shows my band saw, jointer and drill press all on these mobile bases. 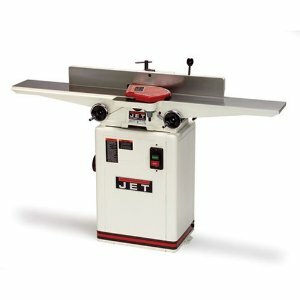 I’ve created a dedicated page just for woodworking jigs and templates. In this section I’ll share jigs and templates that I build along with links to articles how how I made them and use them. 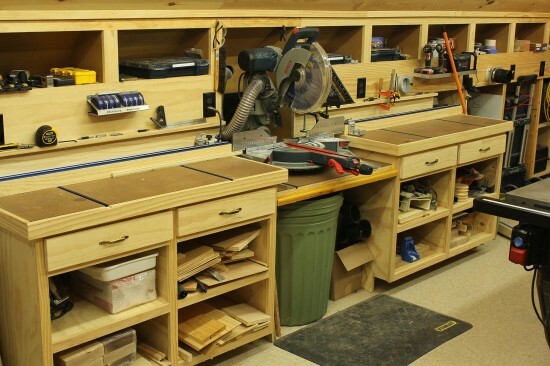 I’d love to have others send me pictures and links to information about their own custom woodworking jigs and templates so others can benefit from them. If you’re interested please send me an email and we can coordinate that effort. This is one of the new machines in the woodshop. 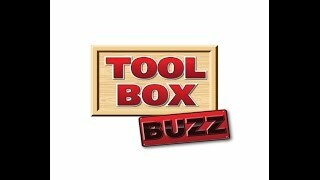 Setup for the tool was very straight forward and easy to use. Out of the box it was nearly perfectly calibrated. It comes with a very sturdy steel base with a nice powder coat finish. If you’d like to learn more about my thoughts on the 28-400 then check our full product review HERE. The DW735 is a serious planer fit for most any shop. The stand is built from high quality materials. The unit runs very smooth. This is one of the finest shop tools I’ve used in years. The finish that this planer produces is really impressive. 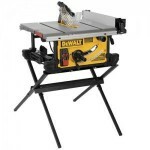 Easy to use controls make this my planer of choice for small shops. 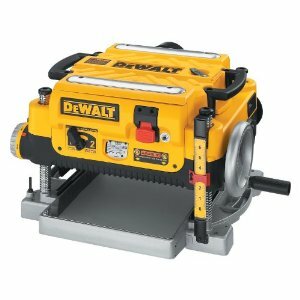 Read my full DEWALT DW735X Planer Review and find out why I think it’s the best in class for small portable planers.